You are here: Home / Skincare / Alternative / What is Ayurveda? Ayurveda “the knowledge for long life”; is a Hindu system of traditional medicine native to India and a form of alternative medicine. Vāyu vāta (air & space – “wind”) is the impulse principle necessary to mobilize the function of the nervous system. It affects the windy humour, flatulence, gout, rheumatism, etc. Pitta (fire & water – “bile”) is the bilious humour, or that secreted between the stomach and bowels and flowing through the liver and permeating spleen, heart, eyes, and skin; its chief quality is heat. It is the energy principle which uses bile to direct digestion and hence metabolism into the venous system. Kapha (water & earth – “phlegm”) is the body fluid principle which relates to mucous, lubrication and the carrier of nutrients into the arterial system. 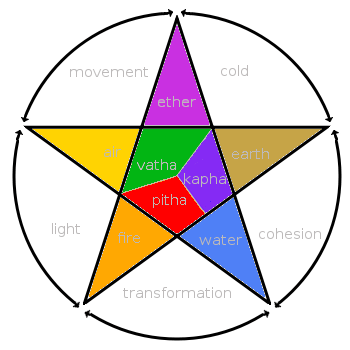 Schematic showing the three humors in ayurveda (pitta – vata – kapha ) and the “5 great elements” that they are composed from. These three substances — doṣas (dosha) are important for health, because when they are unbalanced you too are unbalanced. These teachings are also known as the Tridosha system. One theory asserts that each human possesses a unique combination of doṣas that define that person’s temperament and characteristics. In ayurveda, unlike the Sāṅkhya and Nyaya philosophical system, there are 20 fundamental qualities, guṇa inherent in all substances. Ayurvedic theory asserts that building a healthy metabolic system, attaining good digestion, and proper excretion leads to vitality; while also focusing on exercise, yoga, and meditation. The origin of ayurvedic medicine is attributed to Dhanvantari, the physician of the gods, in Hindu mythology. Balance in emphasized in ayurvedic medicine, known in Buddhism as Madhyamaka; suppressing natural urges is seen to be unhealthy, and doing so claimed to lead to illness. However, people are cautioned to stay within the limits of reasonable balance and measure. The practice of panchakarma is a therapeutic way of eliminating toxic elements from the body. The Charaka Samhita recommends a ten step examination (diagnosis) of the patient. Ayurvedic practitioners approach diagnosis by using all five senses. Hearing is used to observe the condition of breathing and speech. The study of the lethal or sensitive points or marman marma is of special importance. Ayurvedic practioners regard physical and mental existence together with personality as a unit, each element having the capacity to influence the others. Hygiene is a central practice of ayurvedic medicine. Living hygienically involves regular bathing, cleansing of teeth, skin care, and eye washing. Daily anointing of the body with oil is also prescribed. Ensuring the proper functions of channels (srotas) that transport fluids from one point to another is a vital goal of ayurvedic medicine. Practitioners induce sweating and prescribe the use of steam-based treatments as a means to open up the channels and dilute the doshas that cause the blockages and lead to disease.